Not a lot has been written about the POW camp Stalag XIII B, near Weiden, Germany. Its sister camp, Stalag XIII C in Hammelburg, is much better known, in part due to its setting for the TV series Hogan's Heroes, but also because General Patton ordered a raid to free the camp (and his son-in-law) just before the war ended. Stalag 13B opened in 1940 near the town of Weiden in Germany, and housed prisoners of war from many nations: Russia, Great Britain, the U.S., France, Belgium, Poland, Serbia, Spain, and Yugoslavia. At its peak, in April of 1944, the camp held around 35,000 men. 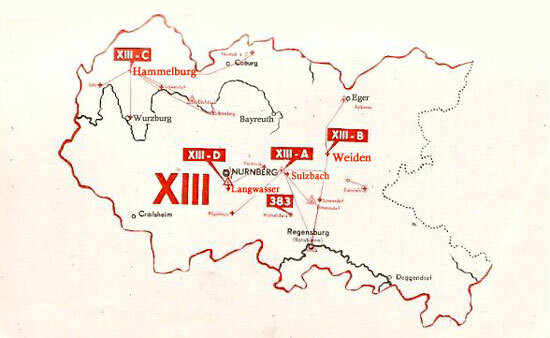 Roughly 90% of the men were assigned to work details in the Weiden area. Some worked on farms, others in factories, and some unlucky prisoners were sent to work in nearby coal mines under brutal conditions. The Western POW's were kept separate from the large number of Russian prisoners. Stalin hadn't signed the Geneva Convention and the treatment of the Soviet prisoners was appalling. The mortality rate was extremely high from malnutrition and disease. A gruesome consequence: the mayor of Weiden in 1941 asked the commandant of the nearby Flossburg concentration camp for permission to send the dead Russian prisoners to their crematorium, because the town cemetery was getting too full. In 1945, after the Flossburg camp was shut down, 26 Russians were buried in the Weiden cemetery and are still there. All the other POW's buried in the town cemetery have been returned to their own countries. On April 16, 1945, Allied fighter planes attacked a train passing through Weiden; the explosions caused extensive damage to some houses and three of the barracks, and several prisoners were killed. According to one of the Belgian prisoners, the Allies knew the camp was there; one of the pilots flew past and waggled his wings at them, as a friendly gesture to the prisoners. Stalag XIII B was liberated by the American forces on April 22, 1945. 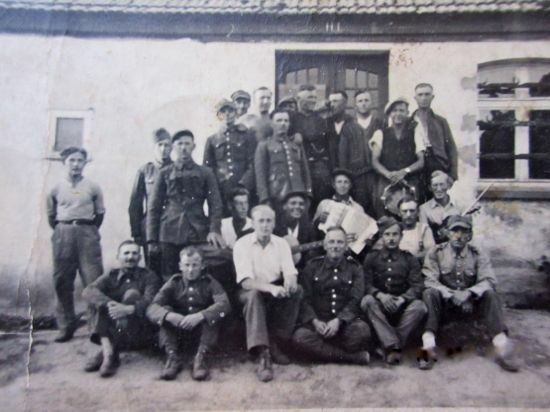 The daughter of Wladzimier Soloducha, a Polish officer who was a prisoner at Stalag 13B, wrote to tell me of her father's experiences in the camp, and provided a photo of her father with a group of other Polish prisoners, as well as his camp identity documents. Soloducha is second from the right, back row, with the tambourine. The photo was taken after the liberation of the camp. The man in the picture with the big watch and the tambourine is my father. He was an officer in the Polish army. He was taken into the army in 1939. At the end of 1939, he would have been taken into the Russian Army; however he had already spent time in the Polish army by that time. My father was a part of a small group of officers that would travel ahead of the main force and report back with whatever information they could find. After Poland surrendered to the Germans, he and his platoon were captured. He was taken from a camp in Poland to Stalag XIIIB. 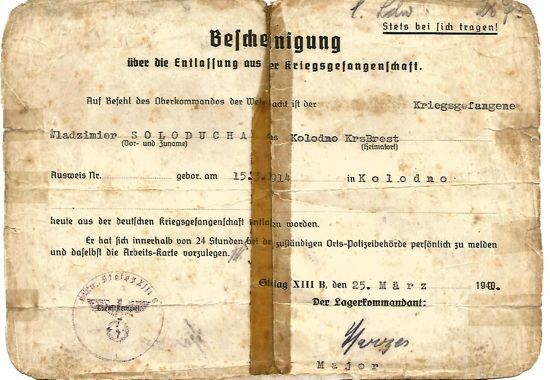 Prisoners in Stalag XIIIB were used as workers on German farms. This is what my father told us: on the camp grounds there were no rats, snakes or mice - they were eaten by all the prisoners. There was a terrible famine, and all had typhus, lice or other vermin. Beatings, humiliations and tortures were experienced by different people every day, because it was part of their daily lives. Fear and hunger were not only behind the wire fences on the camp grounds, the daily companion of the prisoners, but also in the slave labor away from the camp, where the prisoners were taken. My mother was deported at the age of 19 for forced labor, and went to work on a farm with a decent host. She was taken to the farm of Mr. Gipp. She would often travel with Mr. Gipp, delivering food supplies to the people controlling the camp. In 1943, during one of these trips, she was contacted by prisoners in this camp that there was a seriously wounded officer (prisoner) at the camp and that he needed to be moved and treated. My mother was able to move him to the farm and concealed him for several months. One of the farmers had beaten my father so badly that he was thrown onto a pile of corpses, as they assumed he was dead. Other prisoners from the camp were able to communicate to my mother that my father was still alive, and it was necessary to remove him from the territory as his condition was critical. Eventually Mr. Gipp discovered that there was an officer being concealed on his property. Even though Mr. Gipp was a German, he agreed to help my mother. My father was moved from the pig sty into the attic in the farm house and a doctor was called in. They kept my father there until May 9, independence day. The youngest son of Mr. Gipp would have been 13 or 14 years old at the time of the war. He often travelled with his father to Stalag XIIIB, and helped to hide my father. By the end of the war, he had become friends with my parents. My father was lucky that he had met my mother along the way. They in turn had tremendous luck that she was sent to work on a farm for a man with a big heart and morals. Although he was German, he was not indifferent to the lives of others. His older sons fought on the eastern front, but he saved the lives of people from the East, at great risk to himself. He saved not only my father and my mother, but also a very young Russian girl, almost a child, from the Ukraine, and a Polish partisan who worked there. They all survived happily until the end of World War II under his hidden supervision. It would appear that my father was in the camp from 1939 to 1943. From the end of 1943 to 1945, he was hidden at the farm by Mr. Gipp. 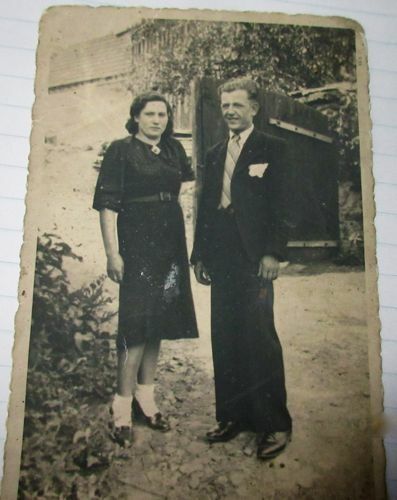 In the fall of 1945, my parents returned to Krakow, with the help of the Red Cross. I recall that as a result of his time in the camps, my father had kidney issues and many scars on his back from beatings. He also had deformed fingers on his hands from being broken. For me, as a daughter, Mr. Gipp was such a great man; I can tell the family with all my heart, just...thank you. Mr. Soloducha died in 1953. After the war, the camp was used to house refugees and was later operated as a U.S. Army post, Camp Pitman. Note: I've noticed some POW websites that refer to a Stalag XIII B in Lamsdorf; that was actually Stalag VIII B in Lamsdorf, now located in Poland. Copyright© 2007-. All rights reserved.